Thanks to SAKET BANSAL AND ' iZenBridge' Team for amazing SUPPORT !!! I appeared for the PMP exam this afternoon on 01st Feb and successfully cleared the same. I now have those 3 professional letters "PMP" after my name. I went through all of the iZenbridge online videos chapter wise multiple times (a must for all PMP aspirants) + solving the questions, followed by Rita Mulcahy, followed by attempting full question papers of iZenbridge/RITA/SCORDO/Kim. 1. Focus on "Understanding the concepts & idea behind each concept", "
3. MUST Go through all of the iZenbridge online videos chapter wise + solving the chapter based questions. 4. Read RITA Mulcahy and focus on "highlighted & important notes"- having gone through Mr. Saket's videos you would have your concepts in place by now; RITA will help reaffirming it. 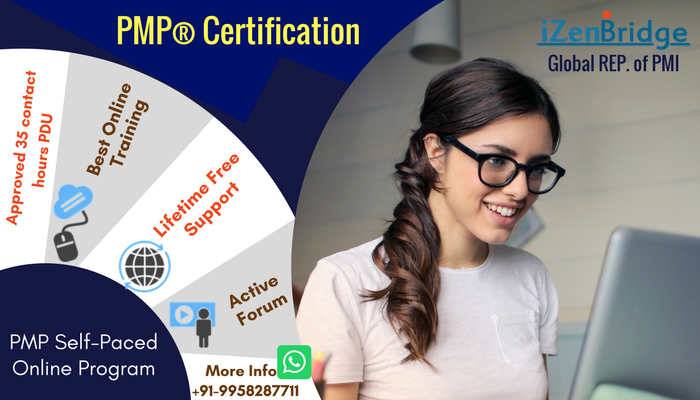 If any aspirant need any information related to PMP & its preparation, drop me mail on aaditya180399@yahoo.co.in and I will be very happy to assist to best of my knowledge. Can you please share how to get Scordo question bank ? is it paid or free ?